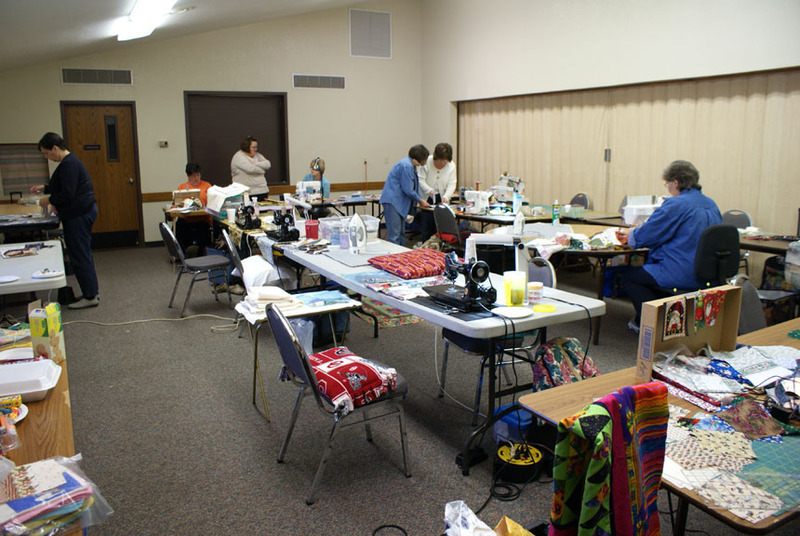 Below is a pic from retreat, but where is everyone? Retreat fell on the same weekend as the OU/Texas game, so they are all out in the lobby in front of the TV. Cindy was working on a UFO and it gave me an idea of how I can use all of my 80’s floral’s. 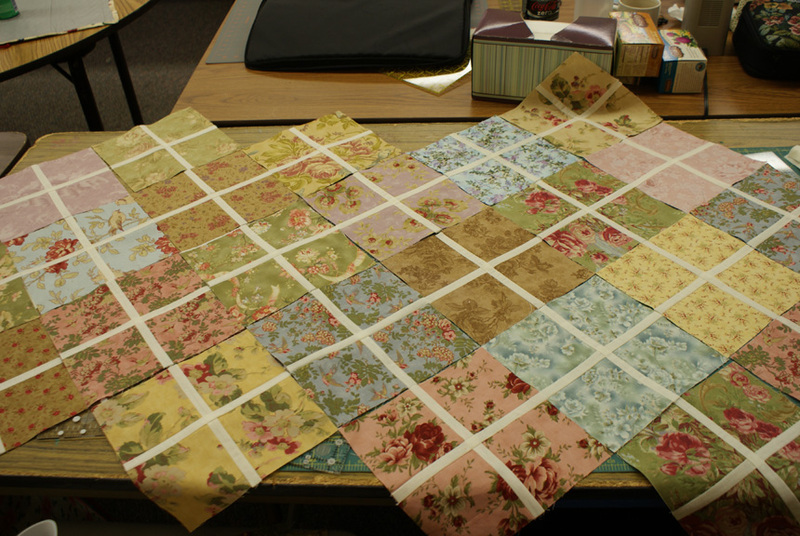 It is 8″ squares of fabric, cut into fourths and the addition of 1″ lattice strips. We also exchanged our packs of 5 inch “cookies”. I managed to get mine all sewn together into a top, but need to add 2 additional rows to make it lap size. I didn’t get any pictures of other people’s projects, and keep forgetting to take a pic of mine. Kerry called one day and asked me if I would make something for a friend of her’s that was having a baby. The baby is now around a month old, and I finally finished and mailed the items on Monday. After searching through Ravelry I finally decided on Autumn Leaves for the sweater, and Afternoon Outing Baby Cap for the hat. For the sweater I did a couple of modifications. First, I made it with long sleeves and also added an eyelet accent before the hem. I’m rather pleased with the results. The hat was a whole other story. Actually there are two hats, because the first one turned out large enough for a toddler. Sorry for picture quality, but the weather hasn’t been cooperating. 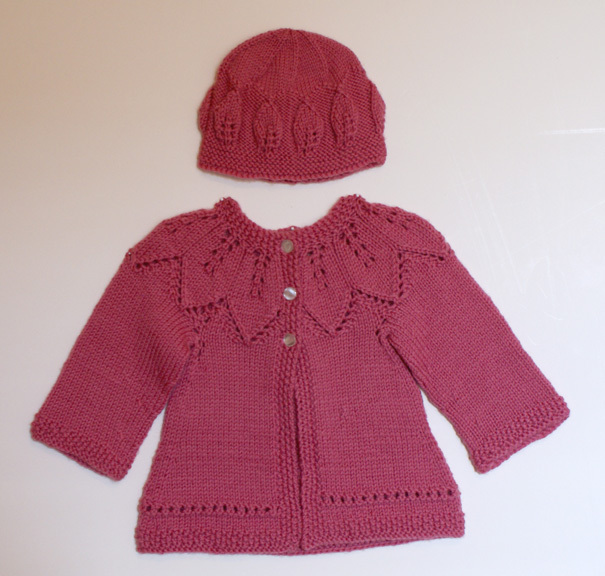 The yarn I used for these is Elann’s Superwash Worsted, and the color is actually a raspberry sherbet color. The sky portion of A Crazy World has been put on hold until I can round up more fancy fabrics in various shades of blue. I’m wanting fabric that is solid, tone on tone, brocade, jacquard or subtle prints, in various shades of blue from light to dark. Not having much luck in the shops around here or online. While I’m searching for blues, I have decided to visit the Far East. So far I just have running stitches outlining the pattern, and it won’t photograph well, the pictures will have to wait until I get further along in the stitching. There may not be much in the way of stitching going on around here for a week or so. I’m cooking Thanksgiving for any of the family that can make it here, and then there will be a “Before the Holiday Madness Party” and real cookie exchange with the Skrappy Ladies and Loose Threads in Lawton. I will be baking, I think, at least 72 cookes and still haven’t decided on which recipe to use. It will be some type of biscotti. But unlike the song, they aren’t jingling or jangling. I’ve been having a lot of heel pain for a while, stretching helped a little, but it just kept getting worse. So yesterday I saw the Dr., got my flu shot and asked him about my heel. Dr. said he thought I had a heel spur and sent me for xrays. Now I’m equipped with special shoe inserts and instructed to keep up stretching exercises. Also to roll my foot back and forth over a frozen juice can to reduce inflammation. Medical folks always say that flu shots don’t make you sick. Well I don’t get “sick”, but I always feel a little off after getting flu shots. So there was no knitting or much of anything else yesterday, except napping and early to bed. It’s definitely the beginning of serious knitting season. There are just too many new patterns coming out that I want to do. I don’t have enough hands or hours in a day. Just out on Knitty is “Oblique“- a cardigan, and “Juno Regina” – a lace wrap. Then there’s also the new issue of Interweave Knits that I mentioned in a previous post with the “Celtic Tote” that I will be knitting soon. Since my Secret of the Stole went by the wayside for the time being, I think I will use the yarn for the Juno Regina wrap. It’s very pretty, but the pattern is simple enough for even my counting impaired brain. Answer – Ravelry. I love the feature on ravelry where you can search for projects using a specific yarn. It’s also a great way to waste time that could be used for knitting. When I first heard about Ravelry (a new knit and crochet community) I wasn’t too enthused, thinking I don’t need another group to join. Then I started hearing about all of the neat features and off I went to sign up to be a beta tester. Of course 17091 people had beat me to it, so I have been waiting impatiently for my invite. I signed up on July 16th and it looks like my invite will definitely be here before the end of the month. The invites are starting to go out fast and furious and now I’m #2077 on the list with 16,991 people behind me. Now I need to find more hours in a day.